A year later you walk through long forgotten caverns with lantern lit. You've finally found the underground lake. A tired face stares back at you from it's reflection. The air tastes sweet down here and in the distance flutes echo of a buried civilization. The feeling of dread washes over you. This is your last chance to get her back from the underworld. 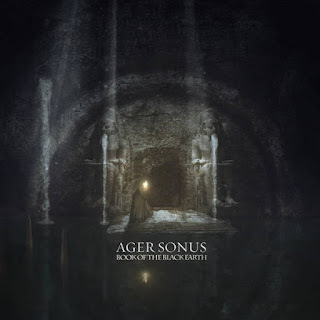 An Ager Sonus album (also known in the world as Thomas Langewehr) was one of the very first dark ambient albums that I reviewed that wasn’t from an artist on the Cryo Chamber label. Now, a good few years later, I am really happy to see that Thomas has joined one of the best known and respected dark ambient labels out there. I know that he has wanted to make an Egyptian themed album for some time as well, so the fact that it's his first Cryo Chamber released album just adds a cherry to the icing on the cake. Hang on, this is dark ambient, so maybe it should be that it added the field-recording to the drone on the soundscape. Dodgy jokes aside, lets get on with the review. Second track The Dead City is an example of the other style of soundscape. The Dead City has an echoing shimmer to it, for want of a better description. A little like a lone adventurer finding an abandoned desert city at night, but a city in which every surface has baked for so long in the hot sun, that they give off a kind of anti-heat, a voidal coating of darkness marked by the absence of the light that birthed it. Discoveries is up next, another soundscape in which uneasy movements jostle against the listener, the sounds of searching, flapping paper and other raps and tappings setting the scene with the suggestion of movement and secrets being unearthed. I had the mental impression of someone pulling back a curtain and revealing the true form of the wizard from the Wizard of Oz in some strange, half-linked way. The next track is probably my favourite on the album, Inner Sanctum. Beginning with the sound of a gong, it soon evolves into a wind brushed environment with animal howls and an introspective air of abyssal meditation, a sanctuary against the light in some ways, as it made me feel like I was deep in the guts of an old temple. Add in a dose of some chanting and strange guttural sounds, and I felt it was one of the darkest soundscapes of the album. One element that didn’t really chime with me were the piano notes that came later in the track, if only for the reason that I had been enjoying the darkness, and they added a slightly unwelcome higher energy to things. A personal taste thing though to be sure. Osriris’s Courtroom next, another echoing soundscape punctuated by metallic shrills and vibrating tones that hint at dead eyed statues and ornate gold detailing at war with the dust, and also at war with the latest intruder to their space. Layers of tradition rubbing against the era that came after, causing a friction that sets the air to tingling against the skin. Apophis is the penultimate track, and the flavour of this one is very much deep bass throbbing and lots of interesting detail sounds like bubbling, tapping and rubble falling. Around the midpoint, things shift to hint at presences that grow and phase in and out around the listener, a feeling of movement, threat and fragility all rolled into one. The final track is Awakening, a 12 minute piece that is quite quiet and introspective. Whispers and a fast flapping rhythm are joined by insect-like effects, creaking and instrumental notes. A fitting track to see the album to its conclusion. Book of the Black Earth is a fine dark ambient album, one that takes the listener from sun to shade, from scorched to chilled, and from open horizons to sealed chambers. It gets a big thumbs up from me, even though I must admit that Egyptian themed media doesn’t often appeal to me. If you enjoy your dark ambient, your Egyptian lore, or even both, be sure to check out Book of the Black Earth. Visit the Book of the Black Earth page on Bandcamp here for more information, and be sure to check out Discoveries below.